Tethered shooting has many advantages. 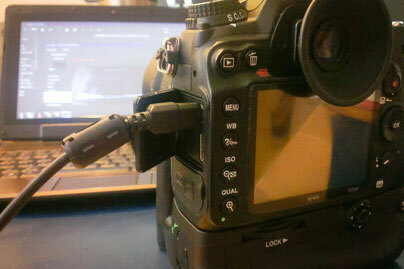 Just plug a cable into your camera and see all the shots you take on your high resolution computer screen. Or put the camera on a tripod, sit back and relax on your computer and use the mouse to trigger the shutter. I have seen this method with many photographers, no matter if fashion or macro photography. So… how to use it on location or at home? Since just a few weeks there is a simple and free solution: digiCamControl. The open source project allows you to use a windows computer and connect your (Nikon) camera. You can even connect multiple cameras and create Matrix like movie effects. The software itself is very self-explanatory. Install, connect, use. A full manual can be found on the website. Of course the idea of tethering is nothing new. Nikon Camera Control has similar features and the popular Adobe Lightroom does the job as well. However, if you want to stick with free software give digiCamControl a try. In addition, the software is not as blown up with CPU-hungry features as its competitors. I tested it with my 1,6 GHz Netbook and the results in performance and speed were comparable to Lightroom on my faster working computer. So if you merely own a netbook and want to have the flexibility and comfort of tethered shooting, I recommend downloading this 40Mb of software.